Some of best inventions are born out of necessity, other are simply by accident. In the case of Eddie Bauer's famed Skyliner—the world's first quilted down jacket—you could say it was a little of both. An avid outdoorsmen, Bauer was trekking through western Washington's Olympic Peninsula when his bulky, waterlogged wool coat became too heavy and he was forced to take it off. "I was climbing a very steep hill when I started to get sleepy," he recalled to the New York Times in 1981. "I reached to touch my back and it was ice. I realized I was freezing to death." Bauer almost died on that mountain, but it was that brush with hypothermia that inspired him to create a jacket that was both warm and wearable. The goal was to make it as lightweight as possible. He'd heard about down clothing used by the Russian Army, so he bought a $25 bushel of goose down and started experimenting. It certainly insulated body heat but it was also lumpy and bulky. To tame the fluff, he added quilting. A ribbed collar and cuffs aided in keeping out chilly winds. A heavy-duty zipper finished it off and the Skyliner was officially debuted to the public in 1936. It revolutionized outerwear for the sporting set and soon became the first patented down jacket in the United States. To celebrate the jacket's 75th anniversary, Bauer's namesake brand is reissuing the jacket, which was discontinued in 1995. 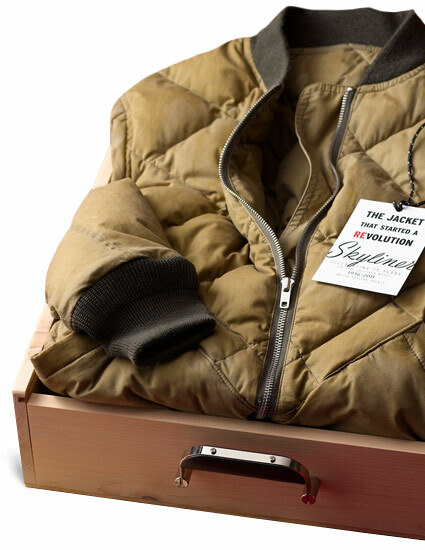 Launching today: a limited edition run of 75 numbered replicas of the original Skyliner, faithfully reconstructed to the smallest details, filled with high-quality goose down and packaged in a commemorative wooden box. Of course, that kind of exclusivity comes at a premium. But thankfully, they're also offering a standard reissue for the rest of us that costs just $150. Early on, Eddie Bauer offered customers an unconditional, lifetime guarantee: Any product that failed to perform as required would be returned, no questions asked. 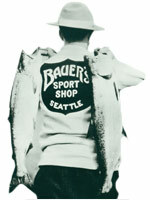 Eddie Bauer opens the store in Seattle that would become "Bauer's Sport Shop." The first Skyliners are sold for $34.50. The U.S. Army Air Corp commissions 50,000 down jackets for their fighter pilots, resulting in their popular B-9 jacket. Jim Whittaker wears Eddie Bauer as he becomes the first American to climb Mount Everest.